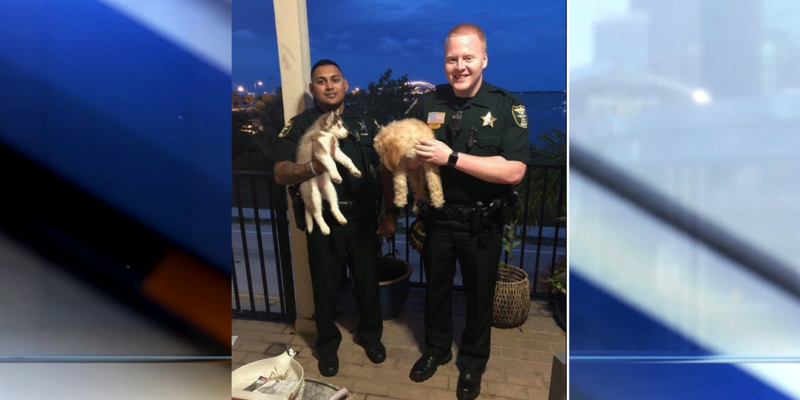 UPDATE: Martin County Sheriff's Office deputies say they have recovered the two puppies that were stolen from a Port St. Lucie store. Two people have been detained and will be questioned, the sheriff's office said on a Facebook post. The puppies are well and in protective custody. Port St. Lucie police have released surveillance video of two women they have identified as suspects in connection with the theft of two puppies. Police say a goldendoodle puppy and a red husky puppy were taken from Paradise Puppies Boutique on April 4 around 4:20 p.m.
Investigators say the two women were recorded on surveillance video. While inside, the pair asked an employee if they could pick up the dogs. The employee said she went into a back room briefly and when she returned the women left with the animals, according to police. Investigators say the pair took off in a black midsize Infinity SUV. SUSPECT #1 White female, thin build, 18-20 yrs., 5’5”-5’7”, blonde hair (Wearing a black long sleeve shirt, shorts & sneakers). SUSPECT #2 White female, thin build, 18-20 yrs., 5’5”- 5’7”, blonde hair (Wearing a white long sleeve shirt, shorts & sneakers).